This weekend was bad. My eyes were running and itchy. I don't typically have a bad reaction with allergies but this year has been a different story. I kind of looked like a crying fool all weekend. Sneezing included. I finally caved Sunday afternoon and got some medicine at CVS. Then I ate cake. I made this late Saturday morning. By Sunday evening it was gone. The whole thing. I blame Mr. J. For someone who claims he doesn't like cake he sure ate a whole lot of this one. I might have helped. Note: The directions below state two layers of Nutella. I found the pound cake batter too dense to spread over two full layers of Nutella. I did 1/2 of pound cake batter, one layer of Nutella, and another layer of cake batter. Can you please it is the end of April already? This month flew by. I am happy the end of is much warmer and more Spring-like than the beginning of the month. Not only does the end of the month bring sunshine but also the Secret Recipe Club post. 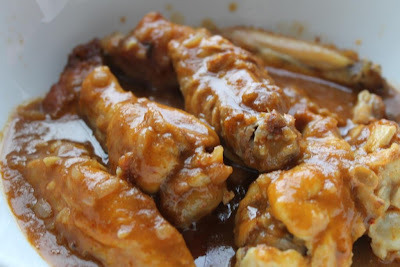 April's blogger is Dorothy from Shockingly Delicious. Dorothy is a fabulous cook whose blog is full of great recipes and tips. Although there were many lovely dessert recipes I wanted to check out, I am trying to be healthy right now and eat as many fruits and vegetables as possible. I almost caved when I saw her recipe for Zucchini Cookie Butter Bundt Cake but remained stead fast with my plan. Mr. J loves cooked carrots so when I saw her recipe for honeyed carrots I thought it would be a perfect side dish for dinner. I didn't change a thing. They came out a beautiful color and the honey really brings out the sweetness of the carrots. We enjoyed them with plain steak from the great and some green beans. Thanks Dorothy for a winning recipe! Wash and peel the carrots, and then slice the carrots thinly on a diagonal. In a non-stick frying pan, heat up the oil and butter, then add the carrots. Saute for about 6 minutes, stirring frequently. Add garlic and saute for another minute, until carrots are tender but still a bit crunchy. Add in the honey and saute for a few more minutes, until carrots are golden. Season with salt and pepper and garnish with some fresh chopped parsley if you like. You cannot get anything better than a roasted chicken. Comfort food at its best. We had a large one the other night and then used the leftovers for these chicken taquitos as part of Pass the Cook Book Club for April. April was all about the Picky Palate from Jenny. I played it safe with the chicken taquitos. The other options for the month were Peanut butter and Jelly Baby Lattice Pies and Shrimp Mango Quesadilla. This recipe was perfect for a busy weeknight meal. All you need to do is cut up some veggies, add chicken, seasonings, and cheese for a delicious filling for the taquitos. 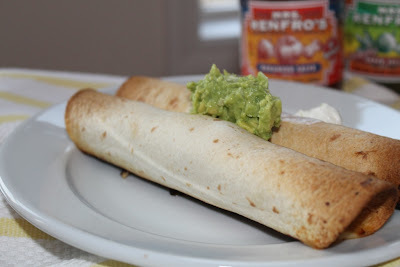 Who knew taquitos could be so easy to make at home? I didn't but I know we will be having these again. To read more about how the cook book club works, see February's post from Kita - Pioneer Woman’s Herb Roasted Pork Tenderloin. To join the club, click the facebook group here. Preheat the oven to 400 degrees and spray a large baking sheet with nonstick cooking spray. Heat the olive oil in a Dutch oven or medium pot over medium heat. Add the onion and bell pepper and cook, stirring, until tender, about 5 minutes. Add the garlic and cook, stirring, for 1 minute. Add the chicken, tomatoes, cilantro, salt, cumin and pepper and cook, stirring, until hot, about 3 minutes. Reduce the heat to keep warm. Add ¼ cup of the chicken filling to the center of each tortilla and top with 2 tbs cheddar cheese. Roll tightly and place seam side down in prepared baking sheet. Bake for 25 to 30 minutes or until tortillas are crispy. it's wednesday and that means another 'what i ate wednesday' post. i have been traveling with people non-stop and had to excuse myself for taking photos of my food. they just laughed. breakfast was a green smoothie. topped with a bit of store bought maple granola. this was a welcome return to normal after a weekend adventure to visit friends in maine. some things just seem amiss when i don't start my day with my greens. lunch was out @ American Joe's. a big salad. love me my greens. not so healthy though when you add cheese, fried chicken, and ranch dressing. it tasted good and i am not going to worry about the possible unhealthiness. it was salad after all. dinner was this marvelous honey orange pork tenderloin with green beans and arugula salad with maple vinaigrette. it has been a while. let's just say life has been busy. instead of freaking out and stressing about posting i just took a break. even tonight i debated about this post. i am in a hotel room in Boston and got lonely. i decided to share a book review as my connection point. maeve binchy recently passed away. it was a posting about her death that brought her many books to my attention. 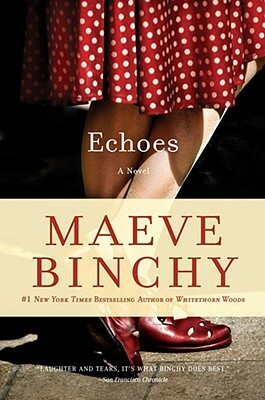 Echos is the first book i read and it will surely not be the last. this books is set on the coast of Ireland where two children grow up in opposite economic classes. one of those children with ambitions to leave Castlebay is Clare, Tom O'Brien's younger daughter. a favorite with the local schoolteacher, she wins a scholarship to University College, Dublin and seems all set for a path of academic glory. the other child dreaming of escape is David Power, the doctor's son, also bound for Dublin university, and probably a dazzling future as a specialist. the paths of these two characters criss-cross in a quite unforeseen ways throughout their young adult lives, and eventually both roads will lead back to Castlebay. the end of their story of ambition, betrayal and love is played out in the seaside town where it began, against a backdrop of whispered family gossip and the tangled skein of past friendships. Is it summertime yet? I know we should be enjoying Spring right now since it just arrived but I am seriously ready for some flip flops, shorts, and BBQ time. I think it is the green grass driving me to day dream about summer. I also think it might have been this very summery dinner from the BHG May 2013 issue. It was so fresh and just screamed "SUMMER". The relish was so good. I will be making it again as a salad topper as well as a side with fish. Brush chicken with olive oil and sprinkle with ground cumin, salt, and pepper. Grill until done, about 12-15 minutes turning once. In a medium bowl combine cucumber, tomato, onion, lemon peel, lemon juice and garlic. Stir until combined. In a small bowl combine yogurt, honey, and milk. Stir until combined. To serve, top chicken with Lemon Cucumber Relish. Drizzle with yogurt sauce. These cookies have been a long time coming. I couldn't get the idea out of my mind. Funfetti sugar cookies with mini chocolate chips. Loads of sprinkles. Loads of chocolate chips. Now that is a mighty fine cookie. I baked them till just barely done and then left them on the cookie sheet to finish the job. They were perfect. Everything I dreamed of cookies. And then Mr. J ate them all. In a medium bowl sift flour, baking powder and salt. Set aside. In the bowl of a stand mixer, combine butter and sugar until creamed together. Add egg and vanilla. Mix thoroughly, scraping down sides when done. Remove bowl from mixer. 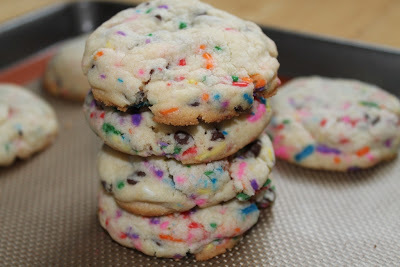 Add sprinkles and chocolate chips and combine with rubber spatula. Scoop dough balls and place onto a cookie sheet. Bake for about 10 to 12 minutes. Remove from cookie sheet after 3-5 minutes and place on cooling racks. I am completely exhausted. I had a very intensive work retreat on Monday and Tuesday. It was great fun but also very demanding. I am pretty drained and would probably still be in bed if I had not had to be in the office. All I can think about is pasta. I think my tiredness is calling for comfort food. We made this pasta dish last week from two peas and their pod and I really wish we had leftovers still. I changed it up just a bit since Mr. J isn't a big ricotta fan. I also added more garlic and you could definitely taste it in the pasta. We thought it was wonderful. Preheat the oven to 350 degrees and spray a 9x13 baking dish with cooking spray. Cook the pasta according to instructions for al dente. Drain and set aside. In a bowl, combine the ricotta, parmesan, and egg. Stir until smooth. Add the garlic, spinach, nutmeg, dried basil, crushed red pepper, and salt and pepper. Put half of the pasta into the prepared baking dish and top with half of the marinara sauce. Spoon the spinach ricotta mixture on top of the sauce in an even layer. Sprinkle half of the mozzarella cheese over the mixture. Cover with the remaining pasta and the remaining sauce. Top with the remaining mozzarella cheese. Cover with foil and bake for 25 minutes. Remove foil and bake for an additional 5 minutes or until the mozzarella is melted. Turn oven up to broil and place pan at the top rack. Keep a close watch cook until cheese starts to brown, about 3 more minutes. Serve warm. I had a different post planned for today. One that wasn't done but I planned on writing Monday night late after a day nonstop meetings for a work retreat. I found out about the Boston bombings through text messages and news feeds. Boston is near and dear to my heart. The finish line for the marathon is a spot where I visit during any of my frequent trips to Boston. I bought my wedding dress in boutique about a block away. I had my job interview my senior year of college that landed me my current job a few blocks away. I have family and friends in the area. I am confused and hurt by the monstrosity that exists in this world. I am humbled by the acts of heroism that emerge after this tragedy. Yesterday I contacted love ones. Today I will pause knowing that I am a lucky person in this world for so many reasons. Prayers and well wishes go out to everyone affected. You know those chocolates at Christmas time that look like oranges. Chocolate oranges. They taste like the candied orange rinds dipped in chocolate. Well, I don't really like those. The other day though I had future cookie dipped in chocolate with a hint of orange flavoring. It was out of this world fantastic. It got me thinking about muffins. And the chocolate. And orange marmalade. Remember those blueberry jam muffins from last week. Well while I was digging in the fridge that weekend I found some orange marmalade. Homemade stuff from the farm stand up the road, complete with bits of orange rind. I figured I would take the jam muffin recipe and add some cocoa, chocolate chips and a whole lot of orange marmalade. Success! I began this little kitchen project at about 6am on Sunday morning. I think I might have woke the neighbors. Maybe if I bring them some they will forgive me. Preheat the oven to 375 degrees and line a 12 cup muffin tin. Combine the flours, cocoa, baking powder, and salt in a medium bowl. Whisk to combine. In a separate bowl, combine the milk, vegetable oil, vanilla, egg, and brown sugar. Whisk to combine, making sure the honey is fully dissolved. Add the wet ingredients to the dry and stir just enough to combine. It will be lumpy. Fold in chocolate chips. Add the jam, and fold the mixture a few times to distribute it, but leave the mixture streaky. Portion the mixture evenly into the muffin tins. Bake at 375 degrees until the muffins are done and a toothpick inserted in the center of the muffins comes out clean, about 15 minutes. The tops will look a bit dry. Remove the muffins from the pan and cool on a rack. I am heading down to Philadelphia today with a bunch of co-workers. Five adults to be exact. We needed a gigantic rental car. They gave me a Yukon. This is Mr. J's dream vehicle. He is besides himself with wanting one now. Clearly our fancy Buick has already lost its allure. This weekend I cleaned the oven. It wasn't super dirty but we have lived here almost three years and I haven't cleaned it yet. The weather was much cooler than expected on Saturday so I decided instead of turning on the heat I would take advantage of one of the last days to comfortable run the self cleaning tool on the oven. After three or so hours the apartment was warm. I had to call my mom though about what to do after it was all done. Never had an oven before where it cleaned itself. Still didn't like having to stick half my body inside to wipe it down but it is way easier than than the last time I had to scrub it all by hand. To celebrate the clean oven I got Starbucks. Thank goodness lattes calm me down. The closest store to me is always packed regardless of what time of day. Every time I leave I am super worked up. The lattes help. Can you think of a worst household chore than cleaning out the oven? There have been several moments in my three year marriage that I wanted to say "I told you so..." I would like to say that I held my tongue most times. I am not that kind of girl though. Mr. J for the longest time would not have Jamba Juice. I don't know why. He just wouldn't order one. Finally about four months ago he had one and loved it. For a while he suggested we make the 20 minute trek to the closest one just so he could have another. This is a time I when I said "I told you so." Then I tried to tell him we could make his beloved Five Fruit Frenzy at home. He didn't believe me. Mainly I think this was because most of my smoothies are jammed packed with spinach and green. He thinks they are foul without ever trying one. Finally I made one with only fruit. Mostly berries. No milk. Certainly no yogurt. The first attempt he said was close. Now he says they are just like the Five Fruit Frenzy from Jamba Juice. I definitely said "I told you so." Mornings have never been the same. Put all ingredients in blender. Blend until smooth, about 2-3 minutes.